These free fashion doll sewing patterns are a complete wardrobe. From an evening gown and stole to slacks and a shell top. You can draw them off using the patterns on this site or you can purchase the ebook for only $2.99 with all the patterns ready for printing and immediate download. Below, if you want a variety of Barbie doll patterns check out the ones listed here. Using an array of fabrics, you can turn the simple and casual into an elegant formal. Be creative using different prints and textures, you will be amazed at how these can add a whole new look to an outfit. Included you will find a formal dress with a wrap, which could also be shortened into a sheath dress. The wrap can be anything from chiffon to faux fur. There is a pattern for a “Roman Holiday” outfit. This outfit could be used for dressing Barbie up for church, for career day or as the title implies, travel. You will also find a versatile outfit that can be used for casual business wear or a day out with her Barbie friends. These 3 free fashion doll sewing patterns include a sleeveless top and matching pants and a skirt. No Barbie collection is complete without a Garden Party dress. Using bright floral scraps you can create a special dress for Barbie’s next tea party. Or use denim scraps or plaid scraps and you could create a Square Dance Dress. And, of course, Barbie will need her very own trench coat. Match the jacket to her outfits or use faux fur and create a fur coat for her. Your little girl will just love dressing up her Barbie in this multi functional wardrobe. Remember, a little time and patience and you can have a cost saving, huge and fantastic wardrobe from these free Barbie doll patterns. This set of patters are all you will ever need to make many outfits for the Barbie doll or any fashion doll of 11 ½ inches. 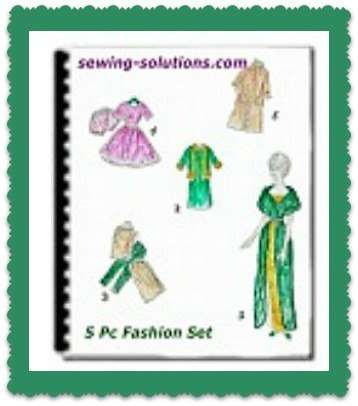 You will find included are the patterns for each piece and instructions for sewing. You will also find each one of these outfits on this site free of charge. You can draw out the pattern pieces on ¼ inch graph paper to get the correct size. But if you would prefer to have the complete set without drawing and just be able to print them off you will find that available here. This is offered for your convenience at only $2.99 in a (pdf) file with immediate download.